2 Nuts in a Shell: A scrapbook page! I got most of the boxes and totes empty in the "office". We don't really have a desk yet, so I only have a fold out table and two small dressers in there. It is not really an office. 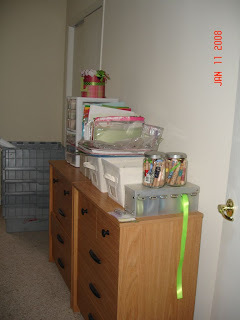 I have my treadmill and workout equipment in there, my scrapbook stuff, and all of our files and bills. So, it is mainly just an extra room. I can't wait to start decorating it! 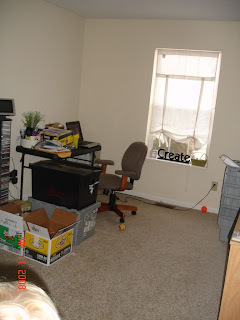 I want to get very creative in here, since I really have nothing I have to make FIT in the room. I can go with any color and style! Very exciting! 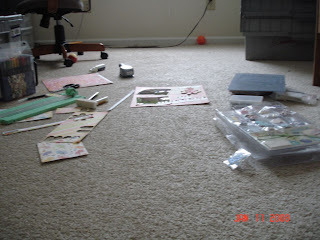 Here is my work area (as of now), the floor! I finished a scrapbook page today. It has been a very long time. I can't wait to get back into it.